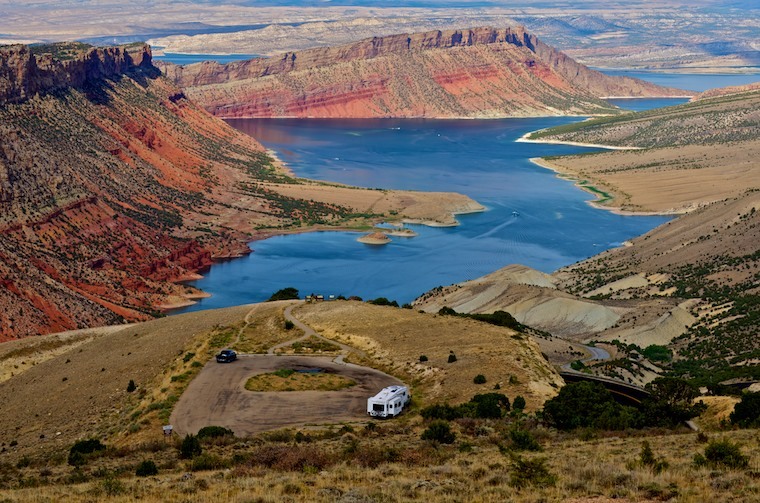 Flaming Gorge, WY - RV Travel and Boondocking at its Finest! 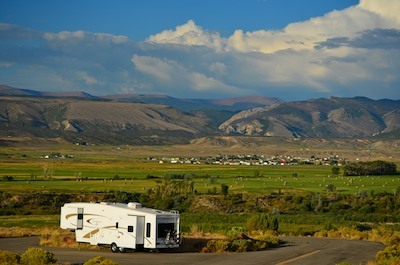 Early September, 2012 – Putting our tire troubles out of our minds for the moment, we left Pinedale and Rock Springs, Wyoming and headed south to the incomparable Flaming Gorge. 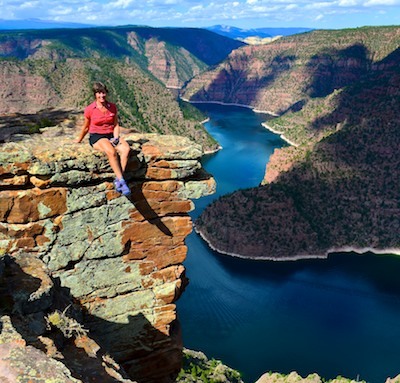 The north half of Flaming Gorge sits in Wyoming and the southern half sits in Utah. Five years earlier, at the beginning of our full-time travels, we had driven down the eastern flank of this large body of water and gotten a glimpse of some of its magic. 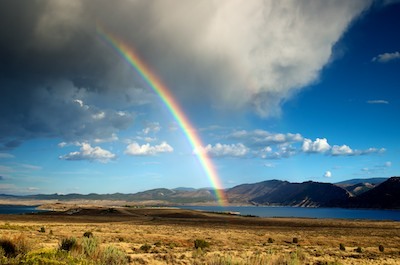 We saw glorious rainbows every day. This time we drove down the western side with plans to stay a while and really soak up its essence. Lucerne Valley has some wonderful views, and we drove and rode our bikes and walked along the roads taking it all in. Late summer in this area produces some fabulous, looming clouds, afternoon downpours and rainbows. 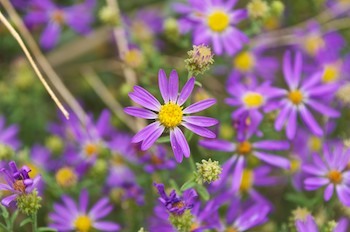 Every day we were treated to nature’s best. 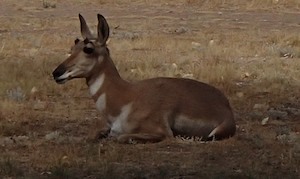 Down in the Lucerne Valley campground a herd of pronghorn antelope had taken up residence. Checking out the views near the Visitors Center. 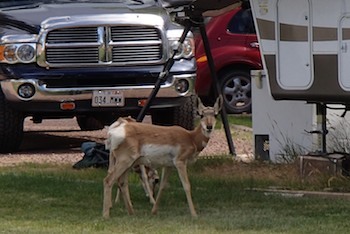 We rode our bikes around the campground loops and we watched the herd wandering between the trucks and trailers, motorhomes and satellite dishes. They acted as if they owned the place! 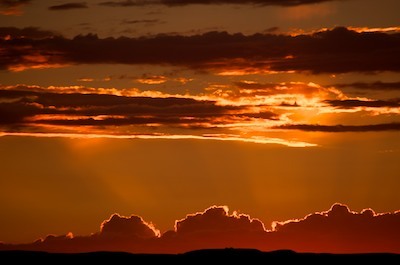 Colors light up the heavens. They weren’t too concerned when we approached, but if we got too close they would bound away, as light on their feet and as nimble as dancers. 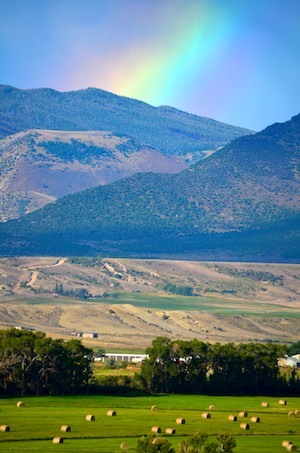 While the views in the heart of Flaming Gorge are all about brilliant red rocks plunging down to the serene Green River a thousand feet below, up in the Lucerne Valley area the green farmland makes a beautiful contrast to the hills in the distance. As the clouds fingerpainted the sky with stormy hues, we kept a sharp eye out for unexpected rainbows and were never disappointed. 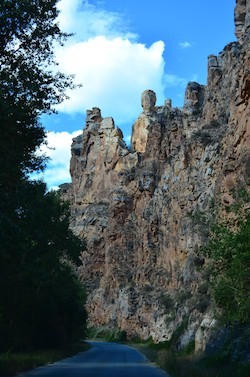 We took the Sheep Creek Geological Loop backcountry drive which is a 14 mile loop off the western side of the gorge. Here we saw soaring cliffs and beautiful views as we crested the top of the loop. 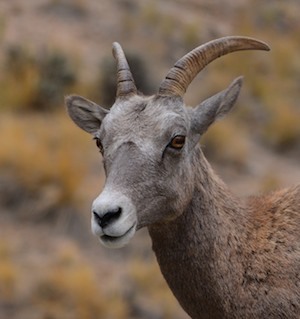 The drive is noted for offering close-up encounters with big horn sheep, but we didn’t see any until we returned to the main road. Then we saw three of them grazing right alongside the highway. One glanced at our truck briefly. He didn’t seem to mind my paparazzi-like camera clicks in his direction as I hung out the window of the truck and took his picture. There are some switchbacks along this steep road, and as seems to have been a common occurrence for us this summer, it started to pour as soon as we started to climb. But the views from the overlooks at the top of the hill were worth every moment of white knuckles on the way up. 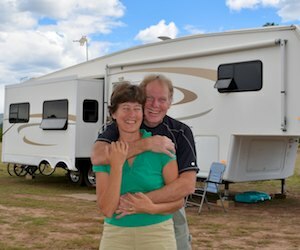 We enjoyed the beauty of this place and we stayed quite a while, first taking a few day trips down to the Utah part of Flaming Gorge National Recreation Area and then eventually heading down there to stay with the rig.